What's better than a bitter, stinging double-edged steel blade? Twelve of them - on two brutal projectile weapons! This is no mere knife lover's fantasy. 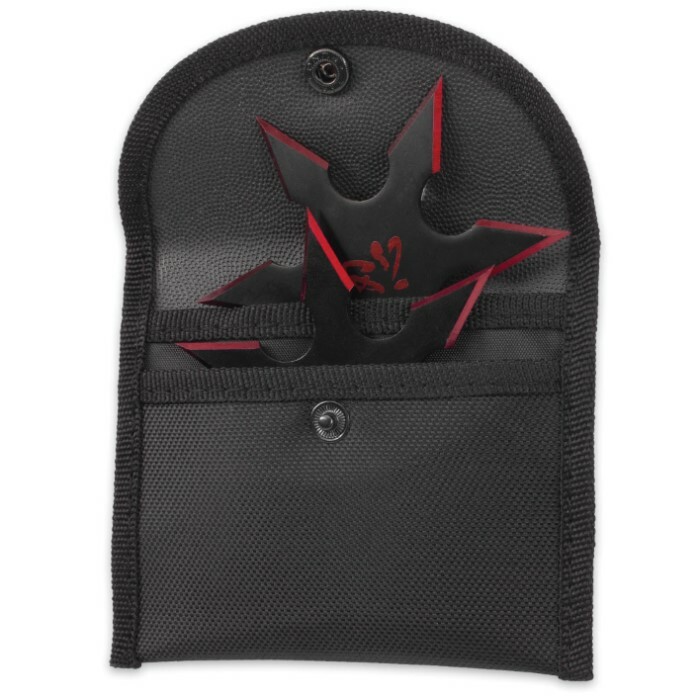 It's real and easily within your grasp - a twin set of savage Six-Pointed Throwing Stars from the throwing cutlery experts at On Target. Each vicious hexagram is a single piece of cold, unforgiving stainless steel shrouded in a discreet nonreflective black coating. A fierce array of six double-edged spear points rings each 4" (diameter) star, and an alluring metallic red finish highlights every razor sharp edge, gracefully offsetting the brooding, somber black. Echoing the dramatic crimson edges, a single red kanji symbol marks the center of both stars. Six points, instead of the typical four or five, multiplies penetration opportunities exponentially, meaning you're much more likely to pierce your target with these menacingly barbed beauties than your average four- or five-pronged throwing star. That's great for beginners and expert "star casters" alike! 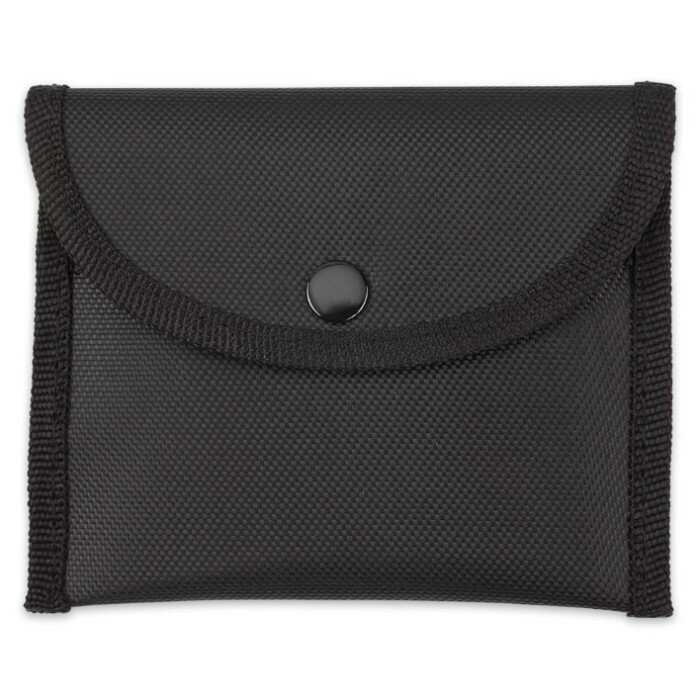 Each star is more than capable of inflicting serious damage, yet small enough to covertly conceal in the included nylon storage pouch. 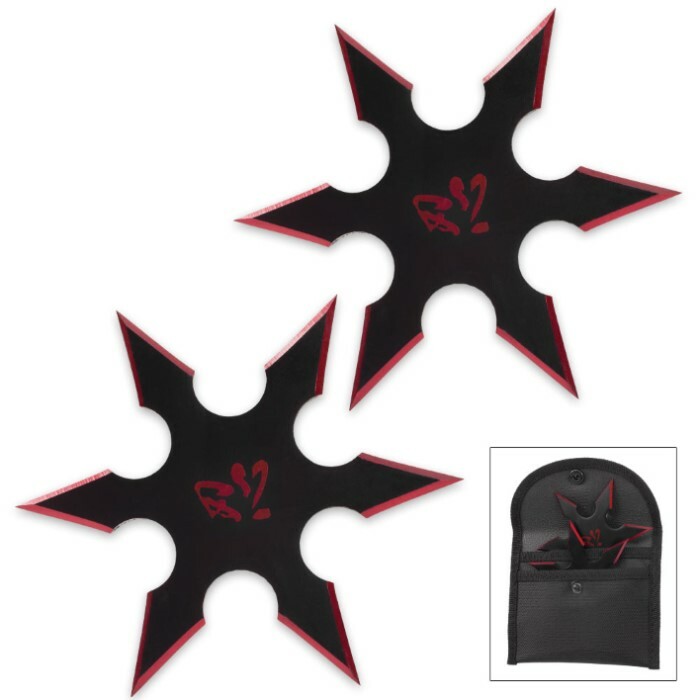 For backyard target practice, stealthy ninja ops and everything in between, On Target's Six-Pointed Throwing Star Set has you covered!